I was inspired to make this hat since my daughter, Audrey loves animals, especially dogs. Ever since she was a baby she loved our Labrador dog! She told me to make the doggy hat yellow to match our dog. She loves to wear this hat all the time! 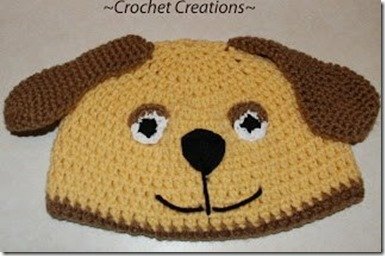 This puppy dog hat is an easy to follow pattern and it’s so much fun to create. I really like how the ears turned out. Hat for a 4 year old child, or use a smaller hook for a smaller size. rnd 1. ch 3, 11 dc in ring, join with sl st. on top of ch 3. -12 sts. rnd 2. ch 2, dc in same st. as joining, 2dc in each st. around. join with sl st on top of chain 2. -24 sts. rnd 3. ch 2 counts as the first stitch, *2dc in next st., dc in the next stitch, repeat from *around, join with sl st. -36 sts. rnd 4. ch 2, dc in the next st., 2dc in the next st., *dc in the next two stitches, 2dc in the next stitch, repeat from *around, join with sl st. -48 sts. If you would like to add ear flaps see my other hat patterns. Edge of the hat, sl st with brown yarn, and double crochet in each stitch around. sl st, fasten off. rnd 12. * sc in the next 3 stitches, 2sctog decrease, *repeat from *around. rnd 13. *sc in the next 2 stitches, 2sctog decrease, *repeat from *around. rnd 14-26. *sc in each stitch around, *repeat from * around. the last round, sl st, fasten off. Attach the Ears to the top side of the hat, about 2 1/2 inches apart. rnd 1. chain 3, join with sl st. to create a ring rnd 2. 10 sc into the ring, sl st. join rnd 3. *2sc in the next st, *Repeat to finish around (20 st.) rnd 4. *1 sc in the next st, 2sc in the next st. *Repeat, sl st. rnd 5. *1 sc in the next 2 stitches, 2sc in the next st, *Repeat, sl st. Fasten off. Place a button in the center of the circle for one eye, and you a button for the other eye. Nose: black yarn Using a yarn needle, Create an upside down Triangle with the yarn and fill in the triangle with yarn over and over until its fill with black yarn. The top of the nose is about 1 inch in size, 1 inch on the sides , place below the nose in the center. About 1/2 inch from the eyes. Mouth: black yarn Using a yarn needle make a 1 inch line under the center of the nose, then make two lines on both sides from the straight line to finish the mouth. fasten off. Hi Kara !…happy week…this is so lovely….I really like it. Cute.Thanks for the pattern. Thanks so much, sweet Anabel!